Last week, we put out a report on some of the effects of Colorado’s Amendment 66, which would increase the state’s individual income tax rate, in addition to moving it from a single rate system to a two-bracket system. In its first year, it would raise taxes by nearly $1 billion. In our analysis, we pointed out an interesting research piece completed by Ernst & Young LLC in 2011, which discussed various aspects of pass-through business taxation. Pass-through businesses pay taxes on their business income through the individual income tax, rather than the corporate income tax. The report found that 57 percent of private sector employment in Colorado was at pass-through entities. 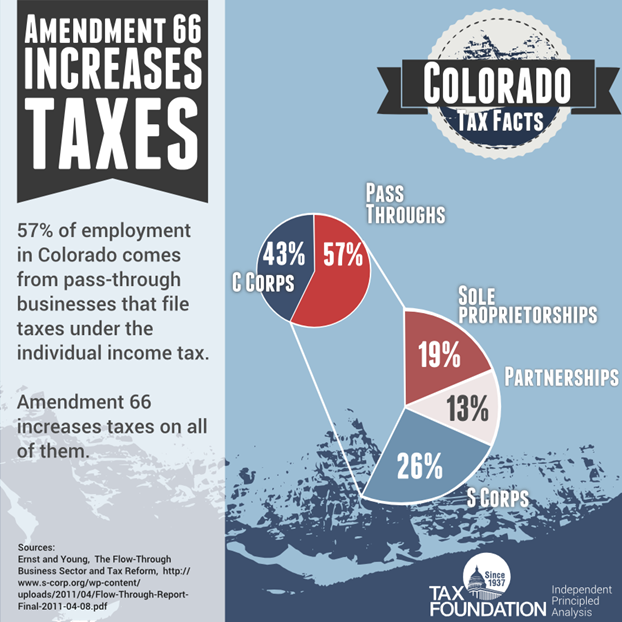 Since they pay individual income taxes, Amendment 66 increases taxes on them all. New and young firms are a leading source of new jobs for the economy. Thus, the proportion of a state’s employment in new and young firms correlates highly with a state’s overall employment growth, meaning that higher levels of entrepreneurial activity are closely associated with higher levels of employment growth. And when small businesses across the U.S. are polled, taxes are a significant concern for them. This trend is prevalent in Colorado, too—recent polling indicates that the large majority of independent businesses within the state oppose the tax increases that are included in Amendment 66. Taxes matter to small businesses, and small businesses matter for economic growth, despite claims that they don’t. Be sure to check out our full report here. More on Colorado here.